In July 2012, I received an email from Ms. Erin-Marie Wallace, M.A., Director of the Fine Arts Department, America’s Auction Network. 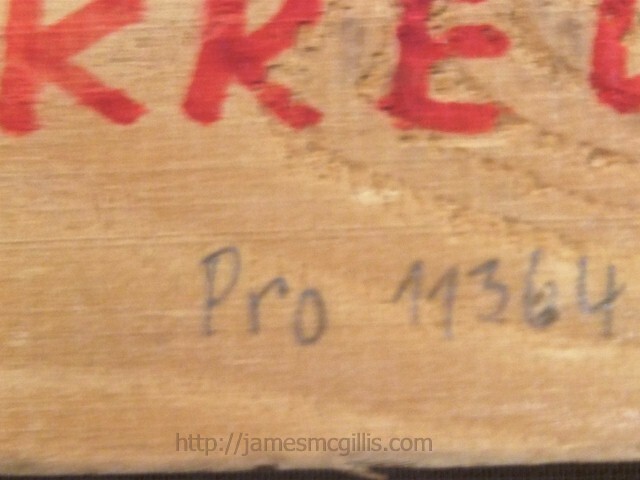 While researching an original Costantino Proietto oil painting that was coming up for a televised auction in August 2012, Erin had come across my articles on the artist. At the time, she was pleased to find my original research, but could find little else about C.Proietto on the internet. As a member of the subscription website AskArt.com, Erin Wallace is able to submit biographical information on any “listed artist”. 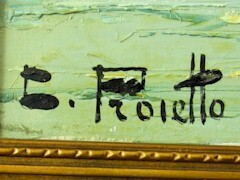 Until now, most art-related websites list the artist as “Constantino Proietto”. I offered to write a short biography on “Costantino Proietto”, which is the proper spelling of the artist’s name. In order to confirm my facts, I spoke with Nunzio LoCastro, a cousin of the artist. From 1951 until the artist’s death in 1979, Nunzio LoCastro knew “Tino” well. If you go to AskArt.com today, you will find the following biography of Costantino Proietto, as submitted by Erin-Marie Wallace M.A. and written by James McGillis, “an independent researcher for Costantino Proietto”. Costantino Proietto (1910 - 1979) – Twentieth Century Italian Impressionist Painter. Born in Catania, Sicily and apprenticed to Prof. Fernand Cappuccio of the Academy of Art, Florence, Italy from 1924 until 1942. During Cappuccio’s restoration of the Basilica of Saint Mary, in Randazzo, Sicily, apprentice Proietto received on-the-job training from the master. In the central vault of the ancient basilica, Proietto’s palette knives restored frescoes and other artwork dating back to the thirteenth century. During World War II, Proietto took the unusual step of emigrating from Italy to Switzerland, to France and finally to Stuttgart, Germany. While in Paris, the artist painted fabric patterns for a commercial fabric house. In 1942, the artist began his independent career in Stuttgart, Germany, where he settled for life. Among local residents and military patrons in Stuttgart, Proietto found a ready market for his self-described “spaddle work”. 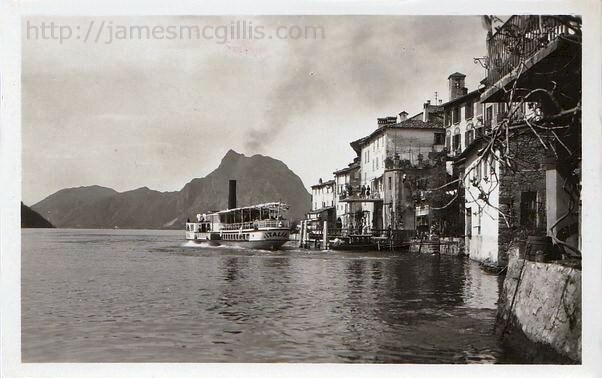 Proietto’s photo album included prints of romantic locations throughout prewar Italy and Switzerland. When the War curtailed travel, the artist referred to his photo album for new subjects to paint. 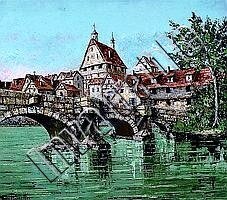 Other than one early watercolor, perhaps of his common law wife, Gisela, there are no brushstrokes in any known C. Proietto painting. 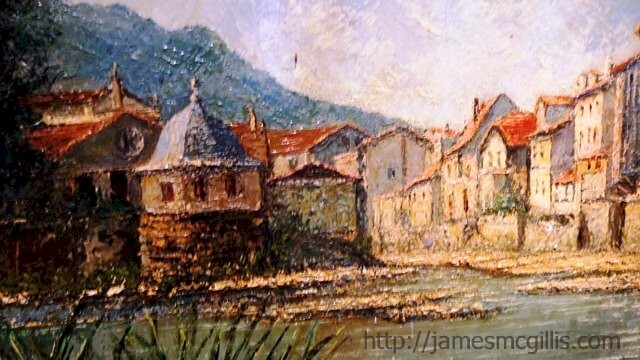 Having earlier mastered the palette knife, the artist’s impasto techniques brought depth and drama to his many landscapes. 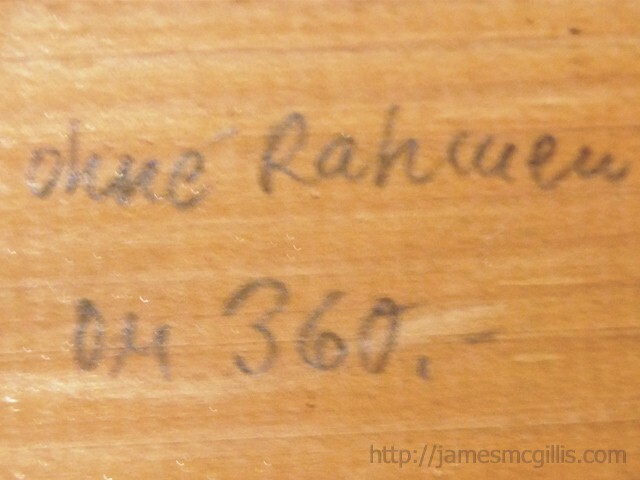 By the 1950’s the word “Kunstmaler”, which is German for “production painter”, appeared on the artist’s business card. Throughout his career, Proietto painted daily at his atelier, which was only a short walk from his apartment. While painting, Proietto wore slacks and a starched white shirt. 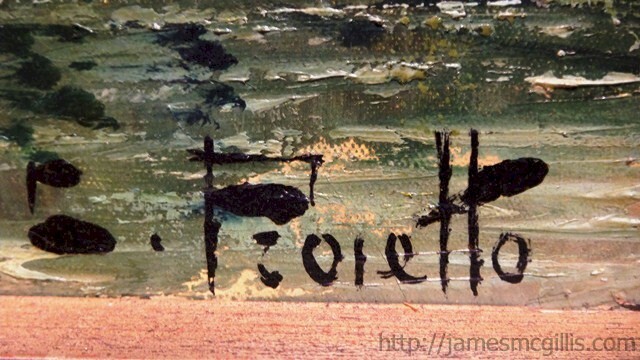 Typically, the artist might complete a small painting in a single day. A larger work might take a second day to finish. Such was the speed at which Proietto often worked. 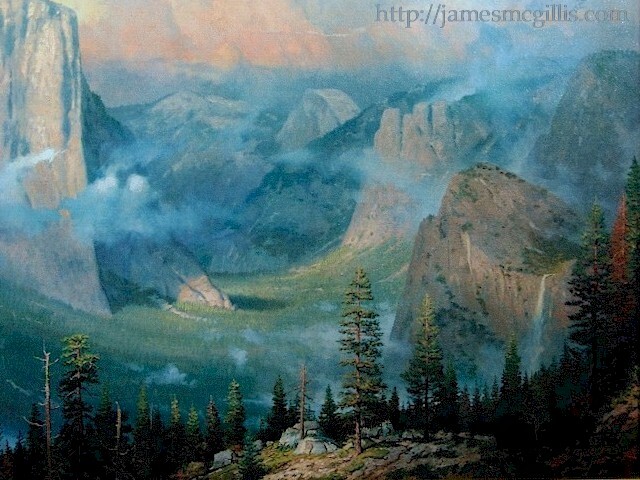 Known for his landscapes, the artist featured timeless architecture in every composition. 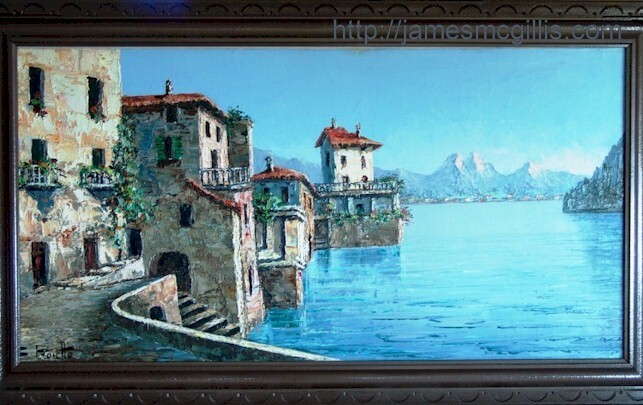 By scraping away or omitting paint on the face of a canvas, Proietto added backlighting to many of his scenes. Although an accomplished portrait artist, Proietto landscapes rarely include more than a tiny human form. 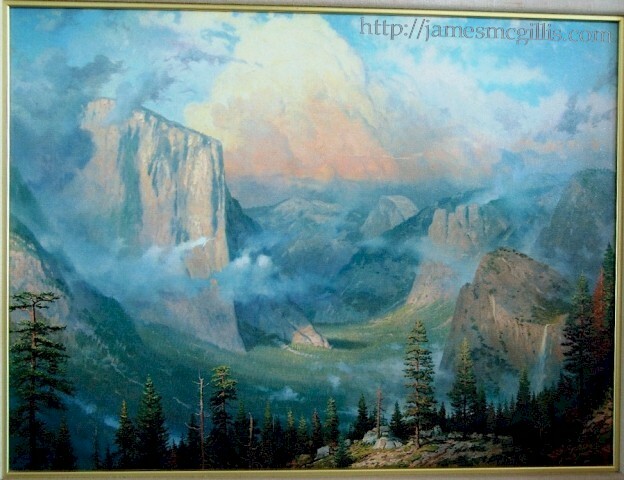 From the early 1940’s, until well into 1970’s, the artist continued to paint six or seven days each week. In the early years, he took off for only enough time to market his works. After the War, he broke from his work twice each year. 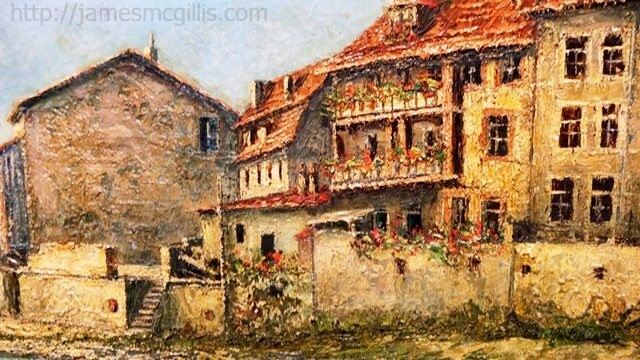 Loading his automobile with unframed works, he would then tour Germany, selling paintings as he traveled. By the early 1960’s, various Allied military bases in West Germany conducted art exhibitions. At those exhibitions, many U.S. and Canadian service members bought Proietto paintings to take back home. Never painting directly from a tube of paint, the artist personally mixed every color that touched his canvases. At times, the chain-smoking artist would flick cigarette ashes into his mix of paint. In the tradition of his cathedral restoration, ashes pre-aged and accentuated the darker colors in his early paintings. 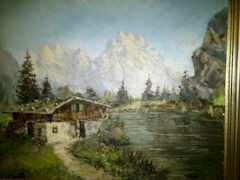 In the 1950’s, with the advent of brighter, more durable paint formulas, the artist’s paintings brightened up, as well. In 1957, Proietto visited the U.S., spending time with American cousins on either coast. By then, he had gallery representation and exhibitions in “New York, Los Angeles and Hollywood”. In his later years, Costantino Proietto purchased vacation property at Sanremo, on the Italian Coast. With the strap of his 35-mm Leica camera always around his neck, “Tino” Proietto continued to search for new scenes to paint. Some later C.Proietto paintings depict the Italian Coast at Sanremo. 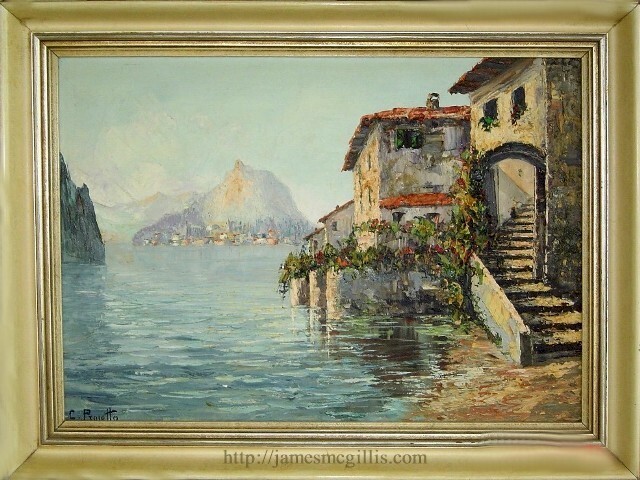 Others, both early and late, depict the Capuchin Convent along the Amalfi Coast. While in his early forties, the artist once told his American cousin, Nunzio LoCastro, “If I died tomorrow, I would regret nothing in my life. I have lived, loved and enjoyed every minute of every day”. True to his word, Costantino Proietto enjoyed each day of his life to the fullest. 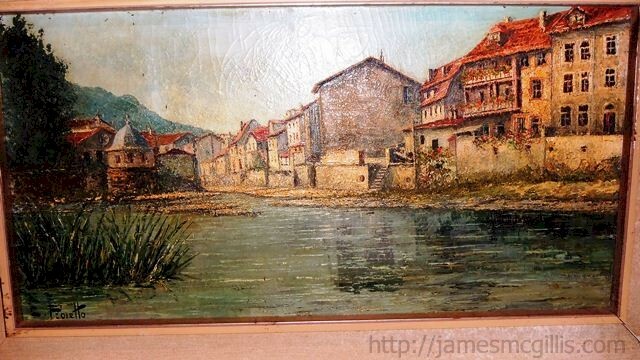 The artist painted until a year or two prior his death. At age sixty-nine, Costantino Proietto succumbed to an illness caused by toxic lead from his early paints. Proietto’s career spanned at least thirty-five years. 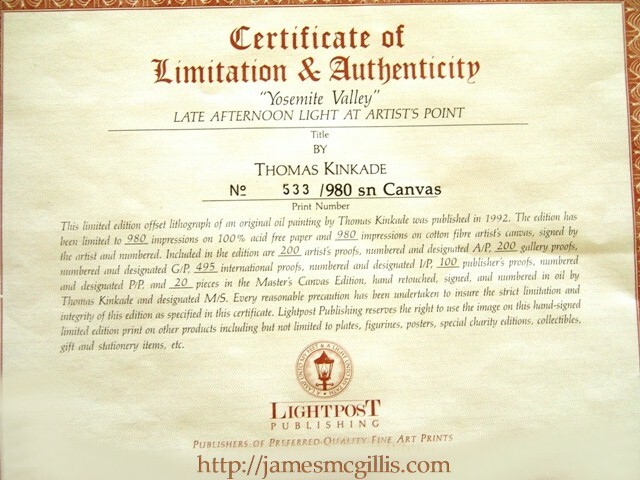 With a conservative estimate of one hundred-fifty new paintings each year, that would bring his career total to over five thousand signed originals. With that amazing productivity, the epitaph of Costantino Proietto might read, “Never a bad day; always a great new painting”. On August 6, 2012, I was simultaneously online and on the telephone with America’s Auction Network. 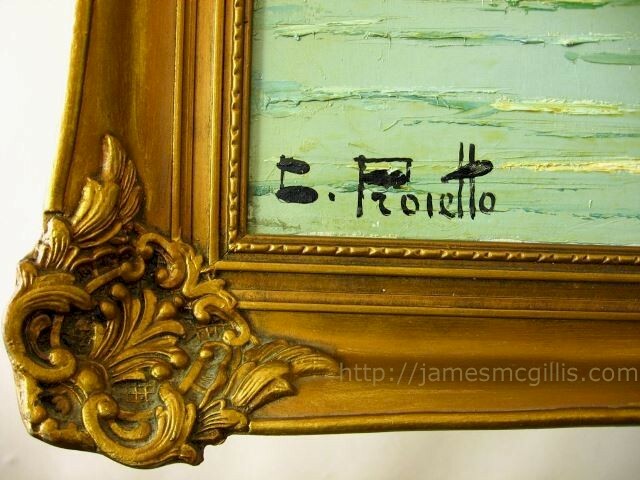 Shortly after midnight, EDT, the Costantino Proietto original oil painting came up for auction. After five minutes of furious bidding against another telephone bidder, I placed the successful bid. 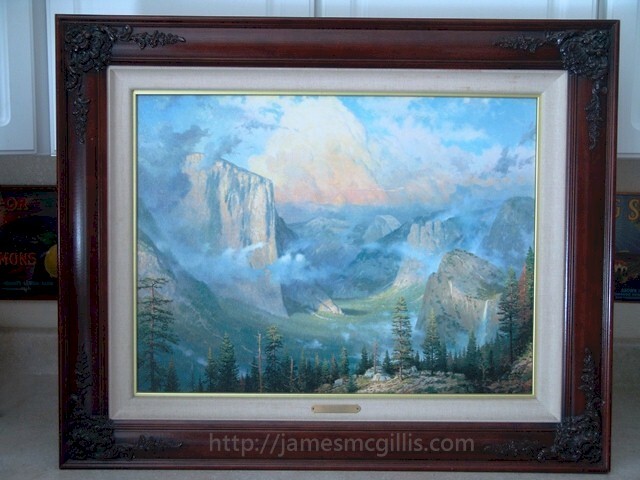 Until I receive the alpine landscape painting, I have only the photo provided by America’s Auction Network to publish here. 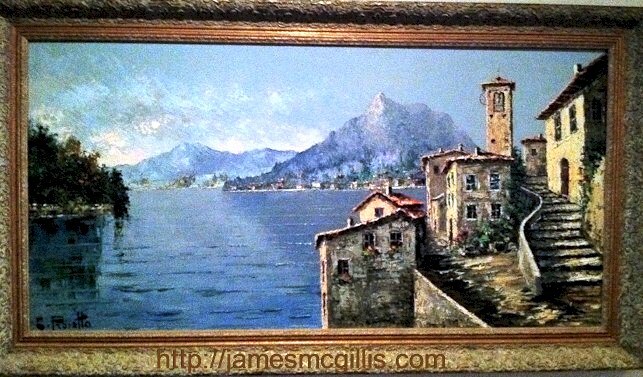 With two similar paintings having surfaced over the past year, we know that my new painting includes rural buildings and the Dolomite Mountains in Northeastern Italy. 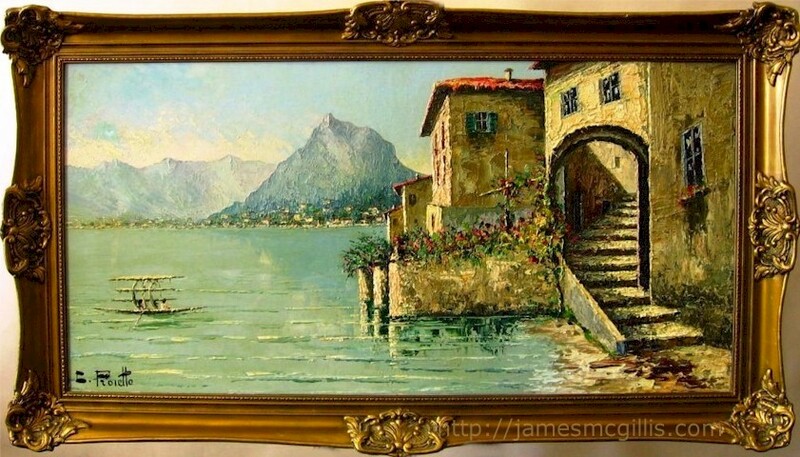 Of the similar C.Proietto paintings, the Karns family owns one and Nunzio LoCastro owns the other. 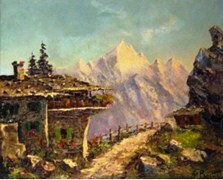 Each painting features different buildings in the foreground, but the rural pathway and the Dolomite Mountains are their unifying elements. 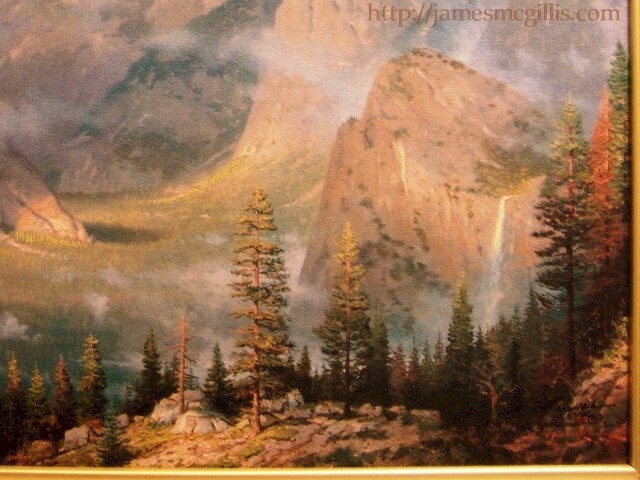 When I receive my new C.Proietto alpine painting, I will publish its image and other details here.